^ Abdul-Adil, Jaleel (February 13, 1994). 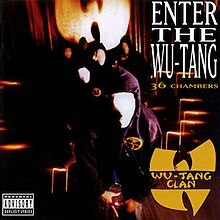 "Wu-Tang Clan, 'Enter the Wu-Tang (36 Chambers)' (Loud/RCA)". Chicago Sun-Times. Archived from the original on November 18, 2018. Retrieved January 13, 2017. (Subscription required (help)). Frere-Jones, Sasha (2004). "Wu-Tang Clan". In Brackett, Nathan; Hoard, Christian. The New Rolling Stone Album Guide (4th ed.). Simon & Schuster. ISBN 0-7432-0169-8.